I recently flew Turkish Airlines on my way back from Mumbai. With a sixty-minute or so layover at Istanbul airport, I was hoping to grab some baklavas and coffee at the airport. But then the flight from Mumbai to Istanbul was delayed. I barely had time to grab my carry-on from the airplane. I was so sure I was going to miss my connecting flight to NYC. And that wouldn’t have been fun. Now let me preface by saying that I love Turkey: great food, rich culture, tremendous hospitality, and marvelous history. But whether you like a country or not, being stranded in a foreign nation is no fun. After sprinting across like a mad dog and going through multiple security checks, I finally reached the travel desk. The gentleman behind the counter, with a warm smile, assured me that I wasn’t late; the flight to NYC was delayed. I decided to breathe. But then he asked me to show my passport. The minute I handed my American passport, the smile on this guy’s face morphed into resentment. He asked me to step aside. And then he shot multitude of questions at me like I was some sort of convict. I was so sure he would not let me board the flight and maybe just detain me forever. I was baffled. The Turks were so nice to me the last time I had vacationed there. Fortunately, while dishing out the third degree, the official flipped over my Person of Indian Origin Card tied to my passport. I tell you, at that very moment, he gave me a look of “genuine respect”. He asked me about India and chatted for a few minutes. Eventually, he let me go. When I narrated my experience to my co-passenger (She’d worked for one of the American airlines for over forty years), she said to me: “It’s sad, but we are not liked in many parts of the world.” For a second I was confused; I couldn’t decipher what “we” represented: Indian or American. Eventually I realized what she meant by “we” and the “responsibilities” this new identity brought along with it. That’s when it dawned on me: the last time I was in Istanbul I was still considered “an Indian” on official paper. Perhaps that’s the reason the local folks had showered such generosity. As I swim through my two identities, I can’t help but wonder at the irony— with my Indian passport, countries made it complicated for me to visit them, but I never once had to wonder about my safety when I finally did get the tourist visa. And with my American passport, I am welcomed into all countries, on paper, but in a surreptitious way. Sweta Srivastava Vikram (www.swetavikram.com), a 2010 Pushcart-nominee, is the author of two chapbooks of poetry from Modern History Press: Kaleidoscope: An Asian Journey of Colors and Because All Is Not Lost and co-author of two poetry collections from Cyberwit: Whispering Woes of Ganges & Zambezi and Not All Birds Sing (upcoming). 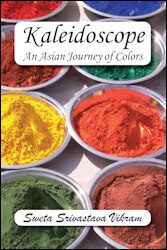 Niyogi Books will publish her first fiction novel in 2011. Her work has appeared or is forthcoming in literary journals, online publications, and anthologies across six countries and three continents. 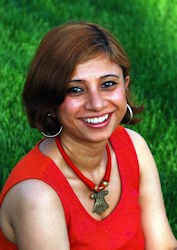 Sweta has held artist residencies, done readings, and taught creative writing workshops across the globe. She is a graduate of Columbia University and lives in New York City. Follow her on Twitter (@ssvik) or join her on Facebook (http://www.facebook.com/Words.By.Sweta).